Bill White Farms on Highway 224 in Park City, Utah. 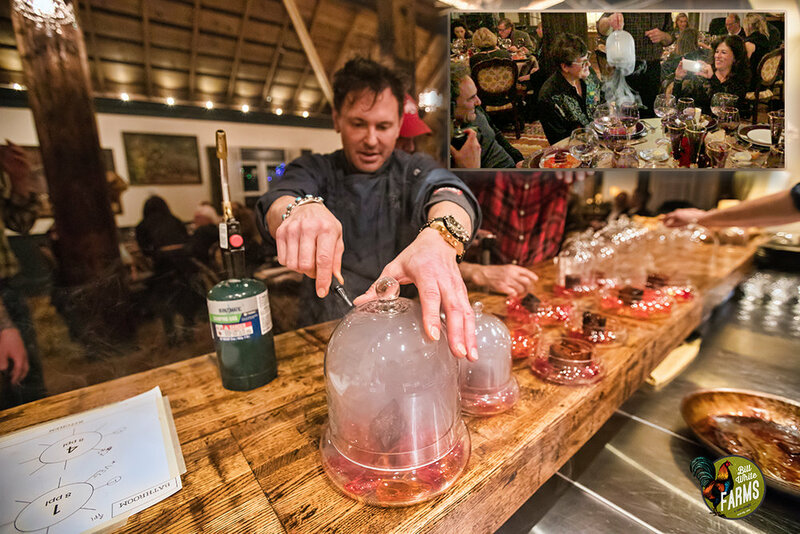 Bill White Farms hosted a private dinner for Zions Bank during Sundance in Park City, Utah on Wed, Jan. 24th 2018. The dinner featured 8 unique courses, each with a particular story, and concluded with music provided by award-winning singer-songwriters. Zions Bank CEO, Scott Anderson, introduces Bill White to the dinner guests. The dinner featured 8 courses, including our Fire and Ice specials. The first course was the Amuse Bouche - deviled farm egg, fresh dill, and barrel caviar. 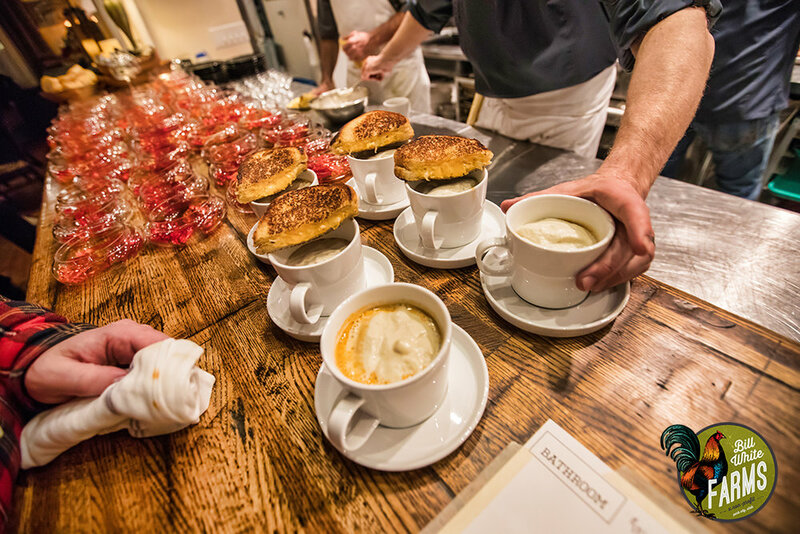 The second course: roasted pepper + tomato "cappuccino" with grilled cheese garnish. This was the dish Bill's mom prepared for him whenever he was feeling sick as a child. The Fire special featured a crispy pork belly morsel with miso cider lacquer, apple + blood orange "gem stones", and fragrant apple wood smoke. 4th course: The Ice course featured orange + herb salad with asian nuances of peanut, coconut milk + exotic silk road spices and a himalayan mist. The Intermezzo was a lemon + prickly pear granita. Bill White prepares the Entree: stuffed farm turkey "fricasse", risotto stuffing with wild mushroom-marsala cream. The dessert was port poached figs, mascarpone cream, and mission fig bavarian. Our chefs also prepared special birthday cakes for 2 of the dinner guests who were celebrating their birthdays that day. Cheers! Before the dessert was served, this amazing couple performed some of their Grammy-nominated songs they wrote. Bill White Farms had the privilege of providing a charity dinner to raise funds for Summit Land Conservancy's effort to save the Osguthorpe farm on Old Ranch Road in Park City, Utah last Saturday on Dec. 9th, 2017. We donated the staff, food, and space to host around 50 guests of SML in hopes of raising around $200,000 for their critical, nonprofit project. Our head chef personally prepared the menu, and over 80% of the food on the menu was grown right here on the farm! During the event, Bill White talked about the importance of preserving not only open space but our agricultural history as well. Our agricultural heritage is what provided the food for both the miners and their pack animals, like the mules that went with the miners deep into the mines. Losing our agricultural history would be losing a huge part of our untold story in Park City, and we are grateful to partner with SML to preserve our unique heritage for generations to come. 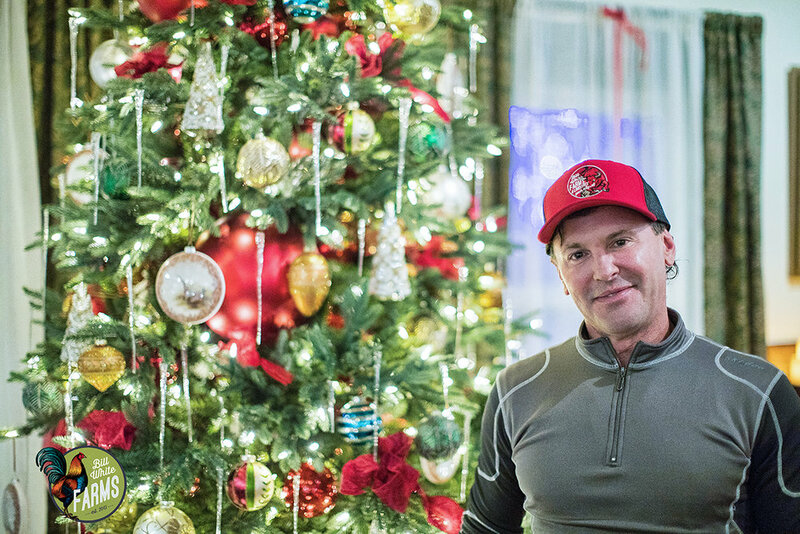 Bill White stands next to the Farms' Christmas tree. Bill White Farms at night. The Summit Land Conservancy benefit dinner. Bill White speaks about the farm to the Christian Center's guests. Our nonprofit mission is to heal the earth through sustainable, non-chemical methods, and we're trying to build a community around these values in hopes of creating a bigger impact. 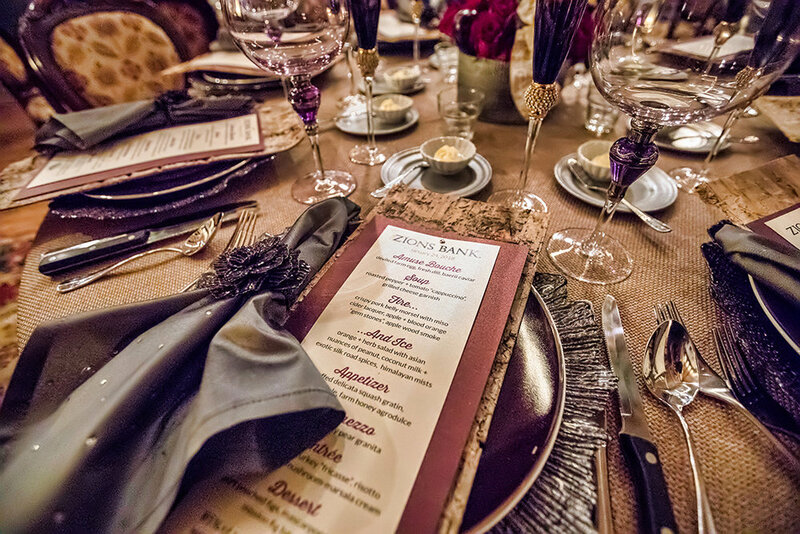 One of our signature, nonprofit programs that helps us build that type of community is our benefit dinner program. 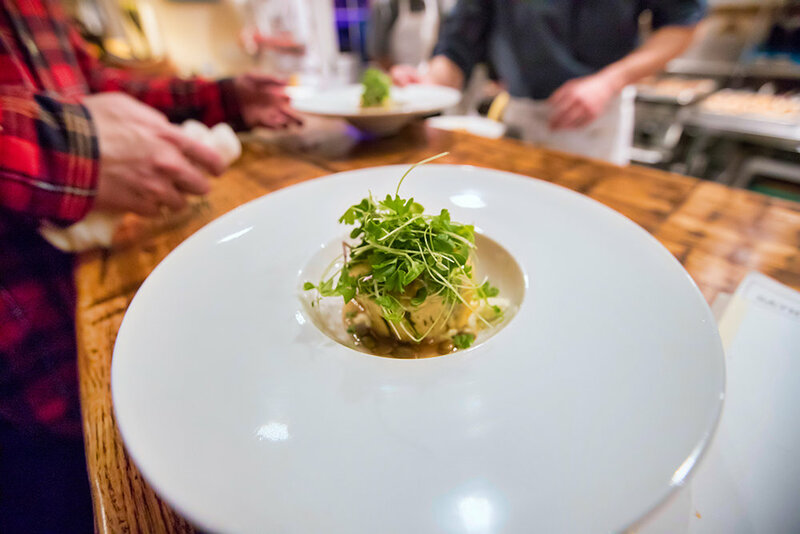 For the benefit dinner, we donate the food and labor to provide an incredible experience for other nonprofit organizations in Park City who then use this dinner to raise funds for their organization. It is just one of the ways we're giving back to our community and trying to heal the earth. 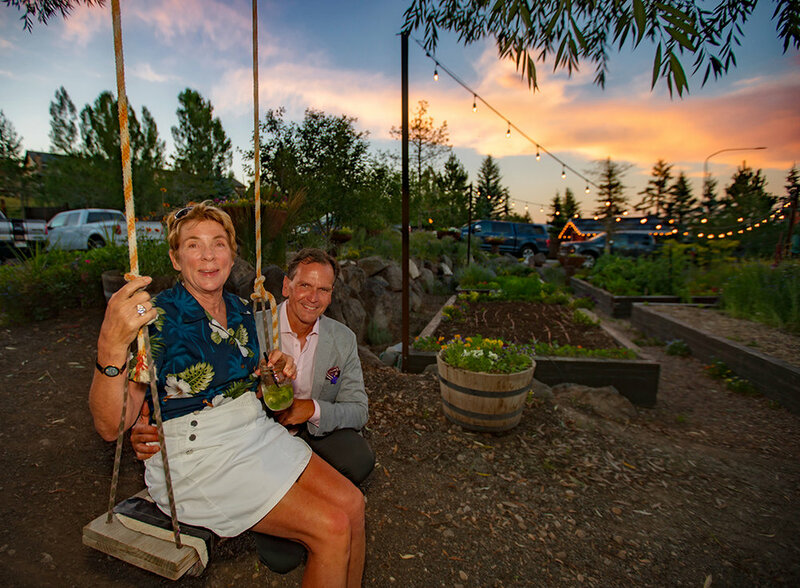 On Monday, July 31st we hosted guests of the Christian Center of Park City to help them raise funds for their Capital Campaign. They are constructing a new building that will increase the capacity of their food pantry, increase the size of their counseling center, and even provide a kitchen demonstration area, as part of their food pantry, to help their clients cook nutritious and delicious meals. They are an incredible organization doing great work in our community, and we're thrilled in partnering with them in our Farm-to-pantry program, our cooking demonstrations, and our compositing program.